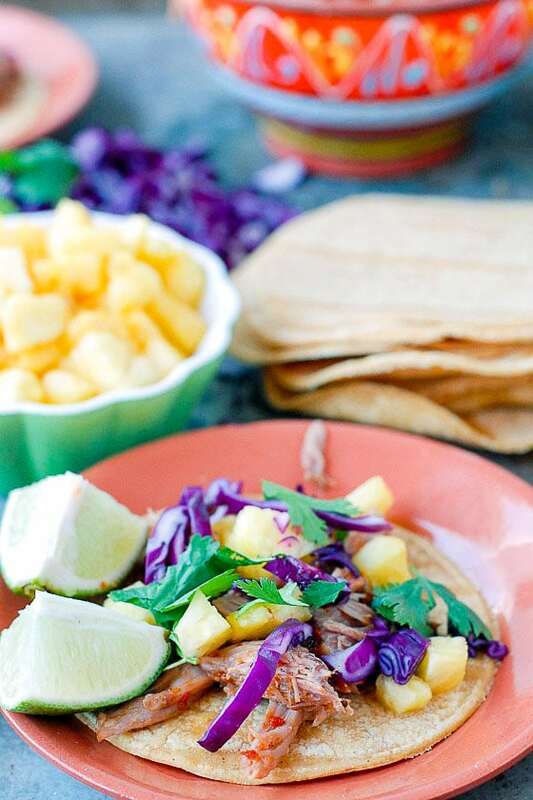 Tacos Al Pastor is a spicy, sweet taco recipe with pork and pineapple. This recipe is easy in the slow cooker any time of the year. 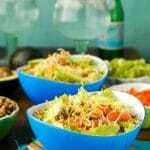 Great recipe for making a taco bar too! There is a misconception about using slow cookers: that they are only good for cold months of the year. Not true. The thought of turning on the oven in the summer is almost unthinkable by July or August. If you aren’t grilling, using cooking appliances like an Instant Pot or slow cookers a welcome relief. This recipe for Tacos Al Pastor will quickly become a favorite all year long. What is Tacos Al Pastor? 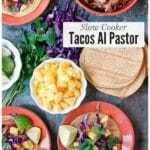 This recipe was originally titled ‘pork and pineapple tacos’ which describes the key ingredients and flavors. Literally translated, Tacos Al Pastor are ‘shepherd style’. Originally they were made with crisp pork shaved from pork cooked on a spit. The combination of spicy chilies, sweet pineapple, onion and pork make a mouthwatering combination. 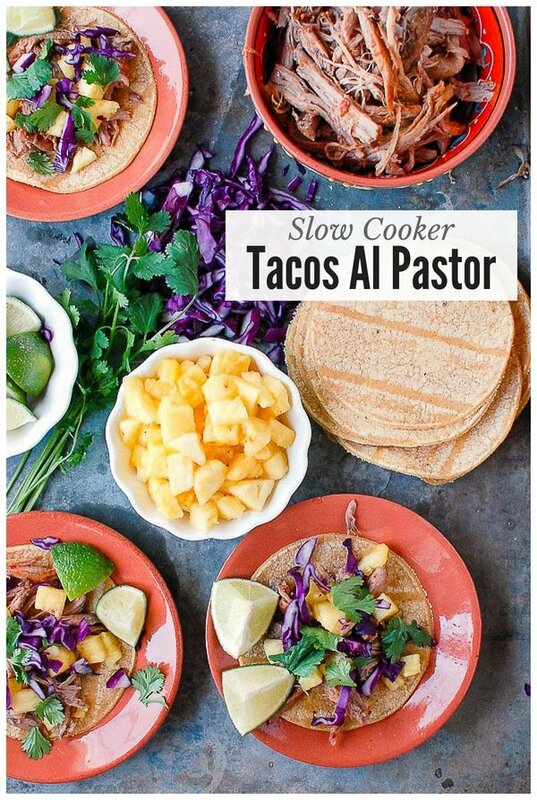 This slow cooker version of Tacos Al Pastor is very easy to make. 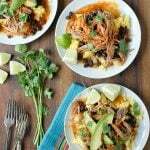 Though this spicy, sweet pulled pork is intended for Tacos Al Pastor, it can certainly be used for other dishes such as a pulled pork sandwich or breakfast tostada. A trimmed pork shoulder is combined with enchilada sauce, brown sugar, fragrant cumin and coriander, pineapple juice, lime juice, onion, garlic, salt and pepper in a slow cooker. The pork may be cooked for 4-6 hours on high temperature or 8 hours on low temperature. After is cooked the pork shoulder is shredded. The Tacos Al Pastor are made with corn tortillas, some of the shredded pork, pineapple, shredded red cabbage and torn cilantro leaves. They are served with lime wedges. Do you love those pink pickled red onions served on street tacos too? This easy Quick Red Pickled Onion recipe is another great topping for carnitas tacos. SERVING IDEA: These Tacos Al Pastor make a great meal for a crowd. 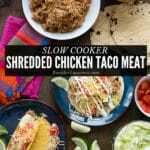 The shredded pork may be added back to the slow cooker with some of the cooking sauce, with other ingredients being set up to make a Tacos Al Pastor ‘serve yourself ‘ taco bar. 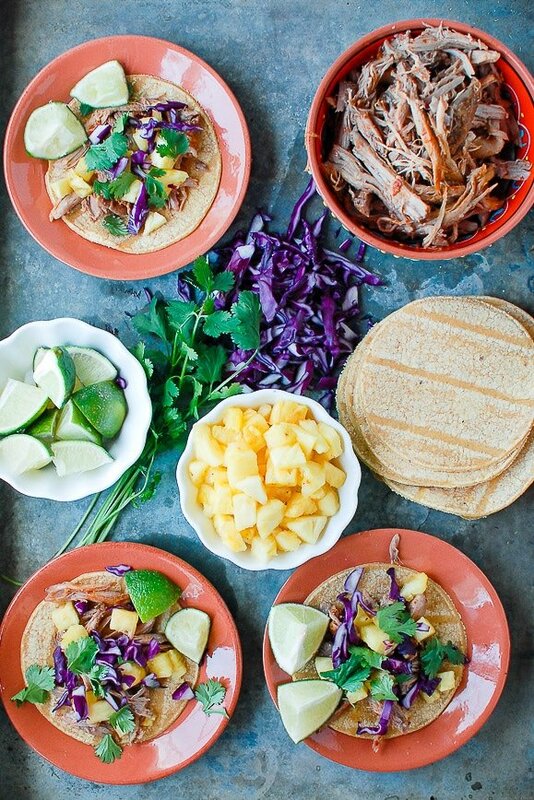 These pulled pork and pineapple tacos cannot be beat for fresh flavors. The pork is so simple to cook in the slow cooker, rendering it moist with earthy spices perfect for making tacos. I prefer making these Tacos Al Pastor with smaller corn tortilla, about 4 1/2 inches diameter or ‘street taco’ size. One can make a serving of a few tacos and despite the smaller size they are surprisingly filling. If unavailable, using traditional size corn tortillas works great too; increase the filling as desired. Tacos are what I’d consider ‘personal’ as it relates to preference on how much filling is used. However I’ve included my suggestions for pork servings sizes below. As a guide a pork shoulder slightly under 2 pounds will yield approximately 3 cups of shredded pork, and I found 1/4 cup of pork was about right for smaller tortillas per taco to still allow them to be folded for eating. A 2-pound pork shoulder will make approximately 12 small tacos. Because you’ve asked, I have a few slow cookers but use this 6 quart Crock Pot brand slow cooker for recipes like this (as well as Slow Cooker Mexican Chicken Taco Meat (for a crowd) and Pineapple Citrus Slow Cooker Carnitas & Carnitas Tacos). I like that it is programmable (‘set it and forget it’) and has clips to secure the lid if transporting it to a gathering. Don’t those all sound delicious? So many tacos, so little time….. If you’ve tried this Tacos Al Pastor recipe please RATE THE RECIPE below! 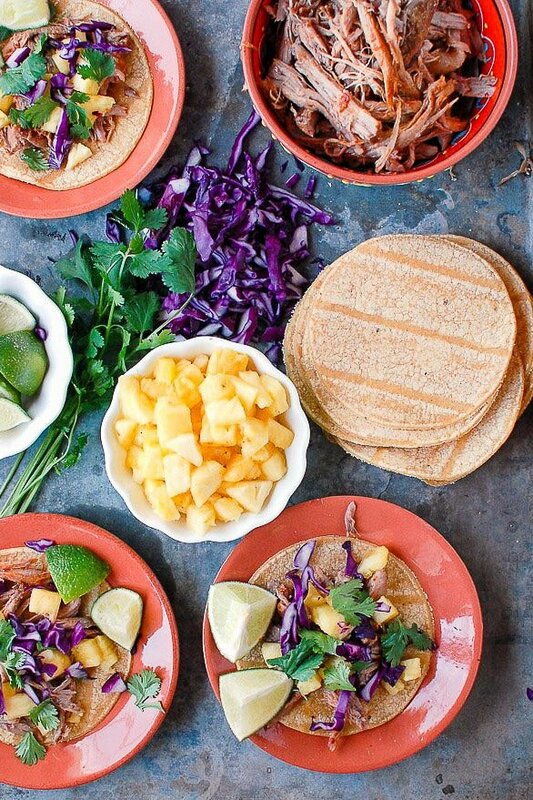 These pulled pork and pineapple Tacos Al Pastor cannot be beat for fresh flavors. The pork is so simple to cook in the slow cooker, rendering it moist with earthy spices perfect for making tacos. Combine the enchilada sauce, brown sugar, coriander and cumin. Stir to mix well and pour into the base of a slow cooker. Turn the pork to coat on both sides with the sauce. Rinse and pat dry with paper towels the pork shoulder. Liberally salt and pepper all sides of the pork shoulder. Place in the slow cooker on top of the sauce. Combine the lime juice and pineapple juice and pour over the pork in the slow cooker. Top with the onions and garlic. Gently spoon the sauce over the onions and garlic and stir them into the sauce, mixing in the lime and pineapple juices to fully mix together. Turn the pork one last time and cook in the slow cooker for 4-6 hours on high, or 8 hours on low. Lift the pork above the slow cooker, allowing any excess sauce to drip back into the slow cooker; set aside to cool until able to be handled easily. Using two dining forks, pull the pork into fine strips or pieces for serving. 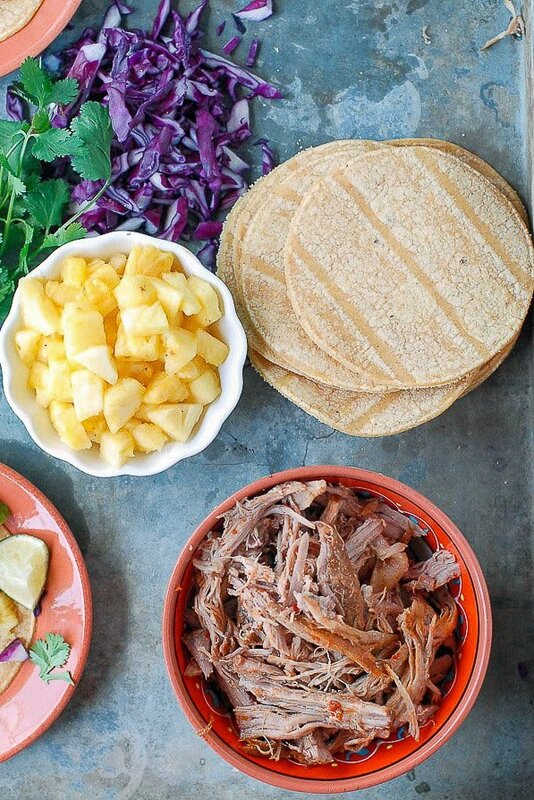 As a guide plan 1/4 cup pulled pork and 1/8 cup pineapple per small tortilla, layered with shredded cabbage for color and crunch, some cilantro leaves and a squeeze of lime. El Pastor tacos are my faves by far! I love the slow-cooker hack here! What a gorgeous shot of tacos! Love the idea of using a slow cooker for them. I love all these flavors together! I would love to give this a try! Looks really good! This is an awesome recipe on making the tacos al pastor style. Love the presentation looks great! 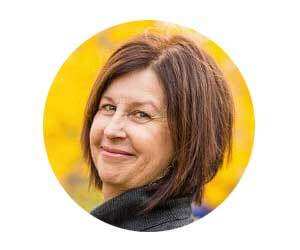 I love a good slow cooker dish! This is going to happen at my house for sure! I use our slow cooker religiously. I’ve never made tacos in it though. These look so yummy! 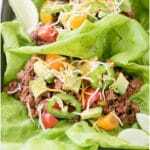 These tacos look super tasty and perfect for summertime. I am definitely making these this week! Pastor tacos are amazing! I’ve never tried making them at home. Your recipe makes it look so simple. Can’t wait to try them.